1. What’s the correct inflation pressure for my vehicle’s tyres? Maintaining correct tyre pressure is one of the most crucial things in a vehicle. Proper inflation pressure in each tyre ensures enhanced- safety, handling, braking and fuel efficiency while it greatly affects the longevity of tyres as well. One should always inflate their vehicle’s tyres as per recommended by their vehicle manufacturer. You can find the correct air pressure for your vehicle make on a sticker pasted on the driver’s door jamb (or on the B-pillar) or in the owner’s manual of your vehicle. Also, as a thumb rule, check inflation pressure when tyres are cold, meaning when the vehicle has only been driven for 2-3 km at max. 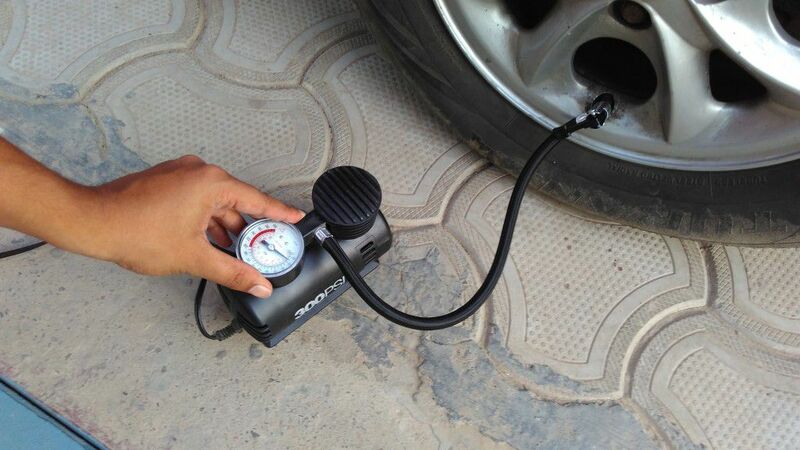 Keep a good quality and calibrated tyre pressure gauge to keep a check on your vehicle’s tyre pressure on a regular basis. It is recommended to adjust the inflation pressure of tyres once in a fortnight no matter what. And always check tyre pressure of the vehicle’s spare wheel as well. 2. What is wheel alignment and why it needs to be done? 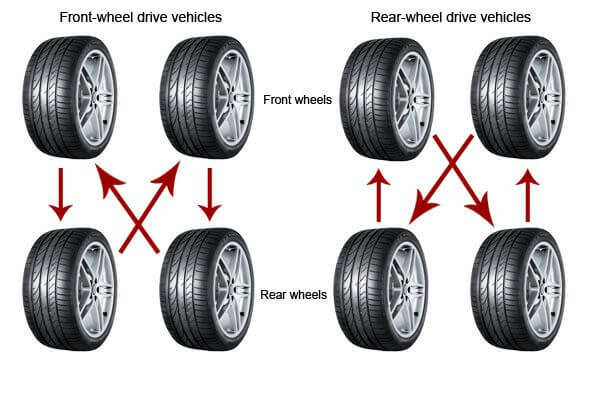 A vehicle’s road-holding components such as all suspension parts, steering components and tyres are aligned in sync so as to follow a straight and efficient wheel trajectory as the vehicle moves along the road. If this setup/alignment is disturbed, it will result in uneven tyre wear along with evident changes in the vehicle’s handling or steering response (for e.g., the vehicle will tend to ‘pull’ to one side). 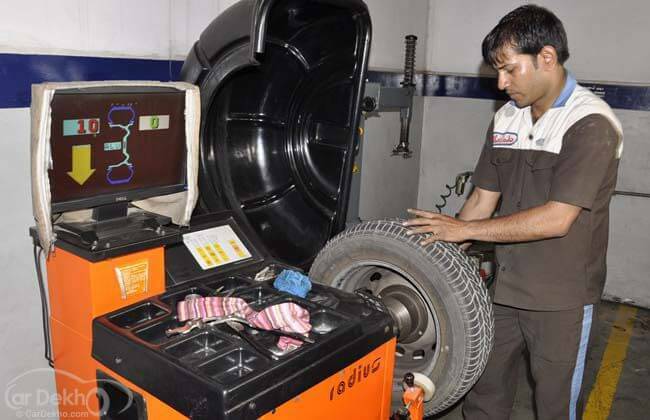 To avoid facing such situations, you should check your vehicle’s wheel alignment at regular intervals without fail. 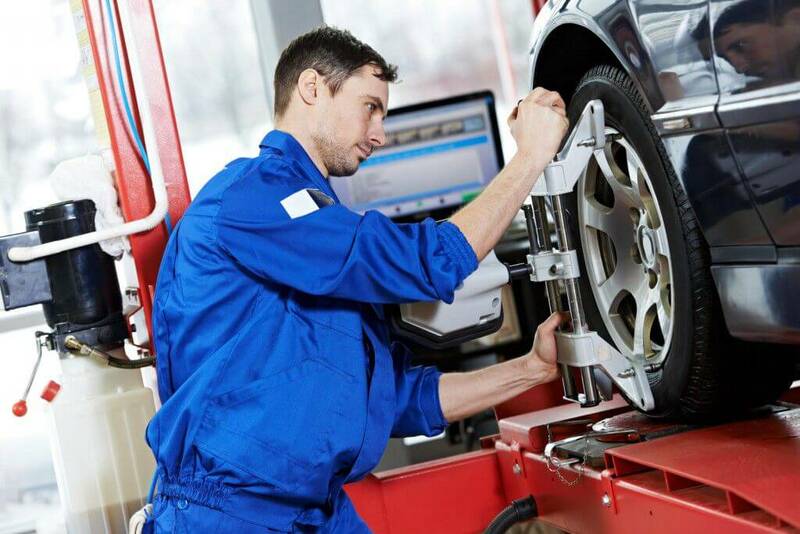 Depending on the type of suspension at the rear, your vehicle may need a front-end alignment or a four-wheel alignment. The costs of getting a wheel alignment done are reasonable and in the long run they more than make for the money spent. Bad roads and bad driving habits affect wheel alignment greatly. If you a have a habit of crashing down your vehicle on potholes or hit bumps without slowing down, your car’s wheel alignment will be affected. Drive more conservatively around such road-surfaces. It is recommended to check your vehicle’s wheel-alignment every 8,000-10,000km, anyway. 3. What’s wheel balancing and how often should it be done? Wheel Balancing is a process that equalizes the weight of the combined wheel (rim or alloy) and tyre all around so that it spins smoothly and uniformly at all speeds. Just like wheel-alignment, properly ‘balanced’ tyres ensure driving comfort and longevity of tyres. Unbalanced tyres in a vehicle will cause vibration, premature and uneven tyre wear while the suspension of the vehicle will also take a toll. Wheel (tyre+rim/alloy) should always be balanced before they are mounted on the vehicle for the first time or when they are remounted after a repair. On an average, wheels should be balanced every 5,000km – 10,000km. 4. Why is tyre rotation required? Tyre rotation is basically swapping the position of tyres on a vehicle after a certain interval. Proper tyre rotation promotes more uniform wear for all of the tyres on a vehicle. In front wheel- or rear-wheel drive vehicles, tyres should be rotated in a “modified X” pattern. This means the tyres being moved to the drive axle are crossed to the opposite side of the vehicle whilst the remaining two tyres are moved from the drive axle to the free rolling axle by remaining on the same side of the vehicle. Following this sequence will allow for a uniform wear pattern for all four tyres. In an all-wheel or 4-wheel drive vehicle, both pairs of tyres are crossed to their new axle position. However, if you are using ‘directional’ tread design tyres on your car, these tyres will remain on the same side of vehicle, meaning they are rotated straight forward and straight back. Tyre rotation is recommended every 8,000- 10,000 kilometers. Four-wheel drive vehicles may require tyre rotation a bit earlier though, around 6,000 – 7,000 kilometers. 5. Could I mend a flat tyre myself? 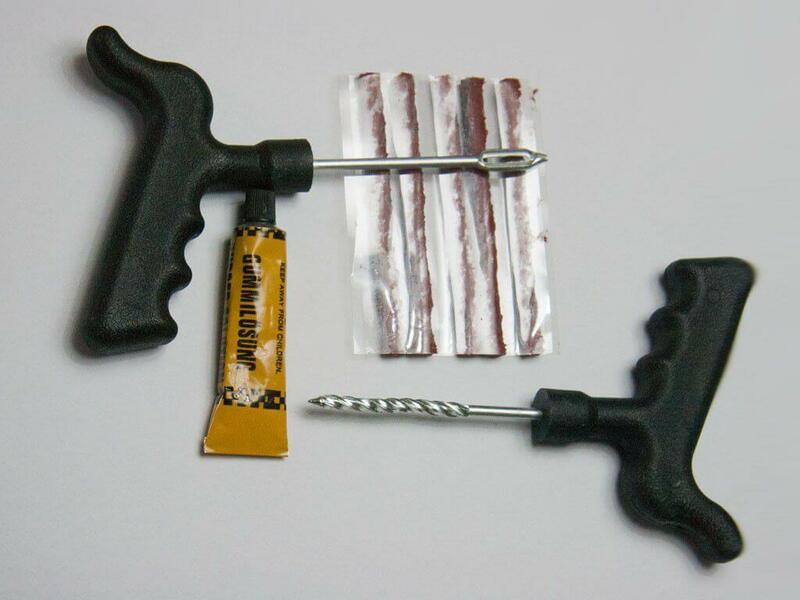 Tubeless tyres can be repaired by an easy-to-use puncture kit that is readily available on the market. While it is a fairly easy method to repair a puncture, try and do the repair job only when there’s an emergency! For instance, if a tyre loses all or most of the air pressure, it needs to be removed from the wheel for a complete internal inspection so as to be sure that it is not damaged. Tyres that run even for short distances without air pressure or are flat can be damaged beyond repair. Tyres having cuts or punctures up to 1/4 inch on the tread are best left to be repaired by trained personnel using industry-approved methods. Fixing a puncture on a tube-type tyre is a herculean task and requires special equipment. It is, therefore, advised to mend a punctured tube-tyre tyre at dedicated tyre repair shops only. Also, before trying to fix a flat tyre, always prefer replacing it with a spare wheel so as to reach a safe spot/puncture repair shop. Since we are on the topic of the spare wheel, do not forget to maintain proper inflation pressure in the spare tyre even when it’s not been used in a long time.